How much for the keys? Why is Ford leaving car fans behind? BERLIN (Reuters) -- Porsche's labor chief, who once fought a merger with Volkswagen, is joining the parent company's supervisory board as a reshuffle of positions at Europe's largest automaker continues. 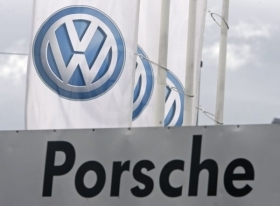 Uwe Hueck, deputy chairman of the sports-car maker, will take up a seat on VW's 20-member panel to replace Juergen Dorn, the former top labor representative at truckmaker MAN SE who last month quit his post to switch to a role in management at VW. "This step will further the integration (with Porsche) within the VW group," VW works council chief Bernd Osterloh said today. "Uwe Hueck has become a strong and reliable partner for us." The two labor leaders were diametrically opposed six years ago during the heyday of Porsche's botched attempt to take over VW. Hueck then backed Porsche's swoop for the group and opposed a merger of equals even as Porsche's financing unraveled and opened the door for VW instead to acquire the debt-strapped company. The 53-year-old, who joined Porsche in 1985, is the third appointment to VW's supervisory board since former patriarch Ferdinand Piech and his wife quit in April after a public showdown with CEO Martin Winterkorn.